Experimenting with natural dyes has fascinated me for a long time. I work on this fascination in bits and pieces. There is so much to try and learn that it is a bit overwhelming. Since we did have this bit of time in Arizona to stay put for a few weeks, I decided to break out my (very small) dye pot and my camp stove and see what could be done with these limited tools. Spring is just beginning here in Arizona so there are is not a lot of plant stuff for the asking. 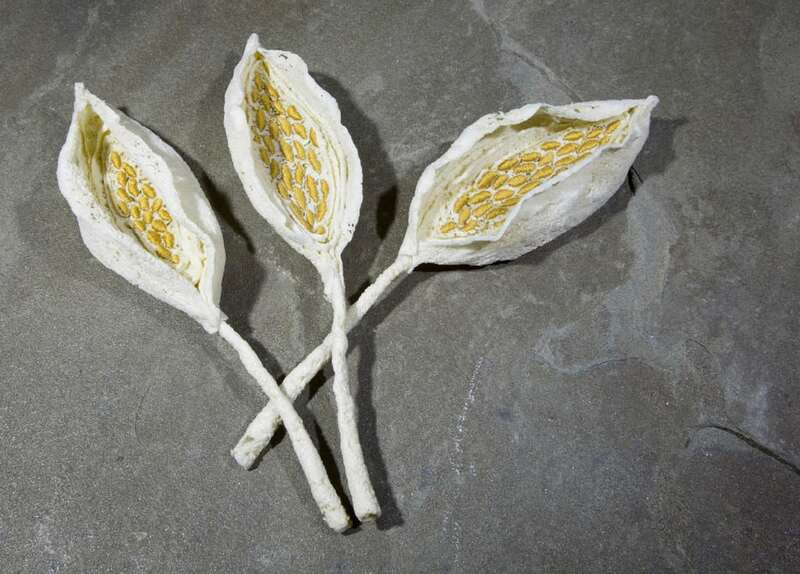 There is, however, the common food stuffs we use all the time that have been used for dyes throughout time. I decided to work with avocado, onions, tea and turmeric. Although I did find a few purple carrots so I eagerly tried those too! but, sadly, did not have enough to do a dye pot. (Keeping my eyes out for purple carrots in my travels!) 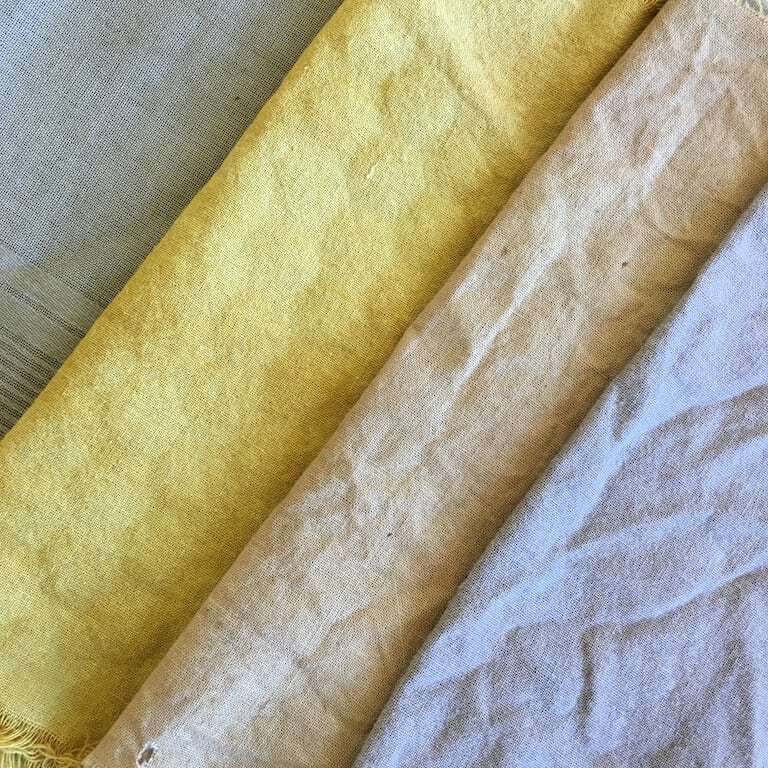 My avocado dyed fabric (to the right above) is more of a dusty rose probably due to the naturally high iron content in the water where we are currently staying. 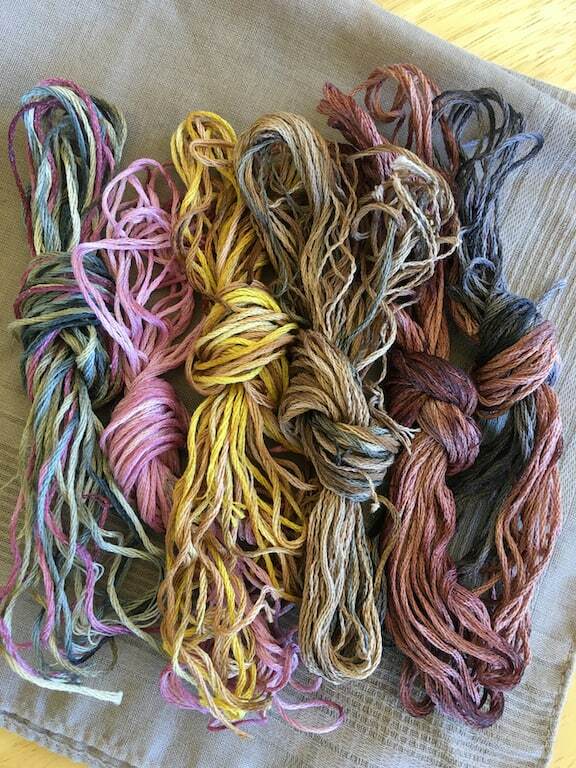 These threads (white DMC embroidery floss) were dyed with (from left) purple carrot, turmeric, yellow onion skins and avocado. The variations in color happened from using mordants after the initial dyeing process. The mordants used were also easily found ingredients for a home/RV traveller: baking soda, wood ash, cream of tartar and iron water. I have to say my favorites were the ones with cream of tartar – just brightened the color a bit. This is the first time I have taken the time to test colors with after mordants to really see for myself what happens – the best way to learn!